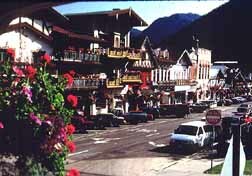 Modeled after a Bavarian village, Leavenworth, on Highway 2 in Chelan County serves as a year-round recreation area. There is a bridge on Waterfront Park that leads to nature trails on 15-acre Blackbird Island. Der Markt Platz, at Front and 8th streets, presents a 30-minute film daily that traces the town's decline as a railroad community and its rejuvenation as a popular resort. The Wenatchee River flows past the town. There is also a Leavenworth, Kansas.